A food named "grilled how you like it" can't help but intrigue and inspire - oh the endless variations! 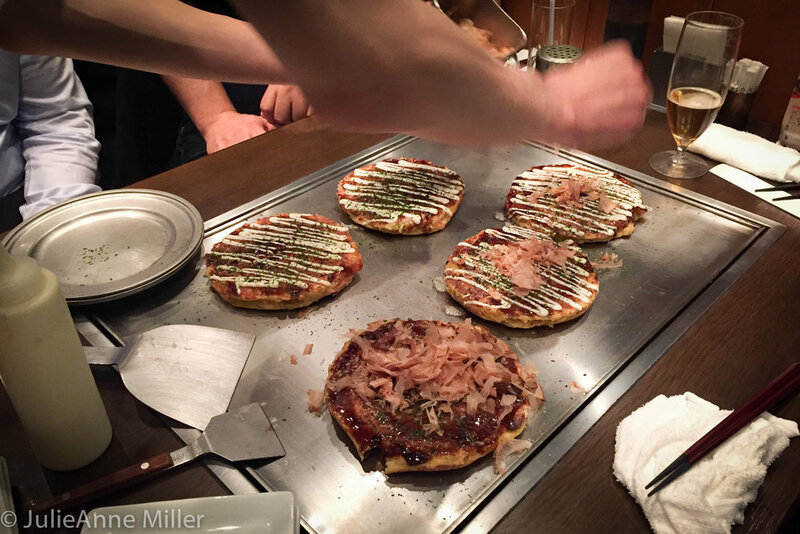 Okonomiyaki is essentially a Japanese pancake made from wheat flour, whipped eggs, and shredded cabbage. These ingredients form a light, fluffy batter to which is added meat, seafood, vegetables - any combo you like! Once the pancake has grilled lightly on both sides, you can top it - yes, any way you like. A traditional set of toppings includes mayonnaise, an easy-to-make ketchup and worcestershire sauce, and bonito flakes (dried tuna shavings). Okonomiyaki is very easy to make, although the trick can be finding the flour outside of Japan. Yamaimo -- a mountain yam -- flour and sometimes powdered dried fish or tempura flakes are added to wheat flour to improve fluffiness, binding, flavor and texture. The key to terrific okonomiyaki is the fluffiness of the batter, so using the right flour is important. I found okonomiyaki flour at a local Asian grocery market in Northern Virginia and I noticed you can also buy the flour, sauces, and bonita flakes on Amazon. The options for fillings and toppings are endless. I love the ideas presented by Just One Cookbook and Okonomiyaki World. Okonomiyaki are usually grilled on a teppan, but I make them on my stovetop in a frying pan and they taste close to the version I had at Chibo Esola in Yebisu Garden Place Tower, Tokyo, Japan. One or two pancakes are filling, so combining them with just a light soup or salad is a complete meal.